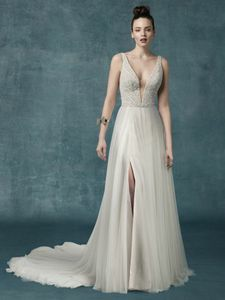 Description: This vintage-inspired princess wedding dress features a beaded bodice, with illusion plunging sweetheart neckline and square back. Beaded straps feature illusion side insets. Sheath skirt comprised of tulle with a princess seam slit. Finished with covered buttons over zipper closure, drifting from back to hem. Includes a modesty panel for more demure coverage in the neckline.